Neural Network Simulation Environments describes some of the best examples of neural simulation environments. All current neural simulation tools can be classified into four overlapping categories of increasing sophistication in software engineering. The least sophisticated are undocumented and dedicated programs, developed to solve just one specific problem; these tools cannot easily be used by the larger community and have not been included in this volume. The next category is a collection of custom-made programs, some perhaps borrowed from other application domains, and organized into libraries, sometimes with a rudimentary user interface. More recently, very sophisticated programs started to appear that integrate advanced graphical user interface and other data analysis tools. These are frequently dedicated to just one neural architecture/algorithm as, for example, three layers of interconnected artificial `neurons' learning to generalize input vectors using a backpropagation algorithm. Currently, the most sophisticated simulation tools are complete, system-level environments, incorporating the most advanced concepts in software engineering that can support experimentation and model development of a wide range of neural networks. These environments include sophisticated graphical user interfaces as well as an array of tools for analysis, manipulation and visualization of neural data. 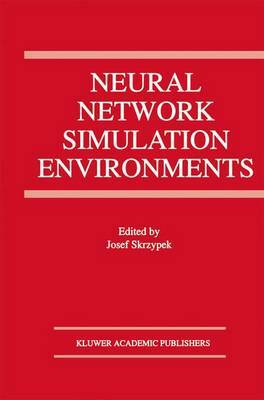 Neural Network Simulation Environments is an excellent reference for researchers in both academia and industry, and can be used as a text for advanced courses on the subject.